It's the most wonderful time of the year! Well, at least some of the time, and that's what this new, daily feature here on Turned on Its Ear will be taking a look at beginning tomorrow, December 1st. I've always been of two minds about the holidays: on the one hand, I'm a true sucker for friends, family, food and presents, and the absolute magic that you can smell on the Manhattan air this time of year. On the other hand, I'm just as big a fan of the irreverent and the absurd in December as I am throughout the rest of the year. Accordingly, this series should be all over the place in a good way: expect to unwrap as many Hallmark moments as Nelson Muntz-style point-and-laughs, as well as some posts that have a nice mixture of both. ...and a good excuse for me to shoot my mouth off at the Holidays. [31 Holi-Days Preview] But What About the Sanity Clause? The Santa Clause is a bad movie starring that guy from Home Improvement. Father Christmas spells his name just like the singer from the Scorpions, except with a "C" instead of a "K" at the beginning. In case that's too many links for your fevered heads to handle, Kris Kringle's alias is spelled CLAUS. No "e". Thank you for playing. As God is my witness, this is as much a Thanksgiving tradition for me as stuffing and Black Friday gas. Enjoy. 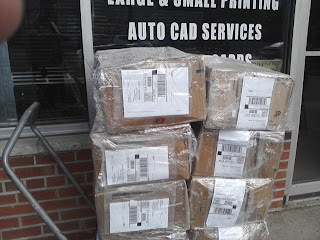 The picture's not great, since I had to grab it and run, but this is a stack of Borders distribution boxes, all sealed up with that company's famous security tape ("stop tape" in the parlance of the stockroom), being delivered to a random little store at the top of my block around mid-day today. That's kind of strange, right? 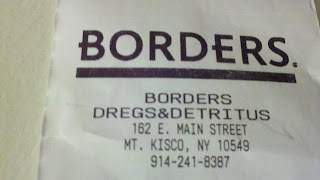 Where did they come from, nearly two months after Borders honored its final coupon? 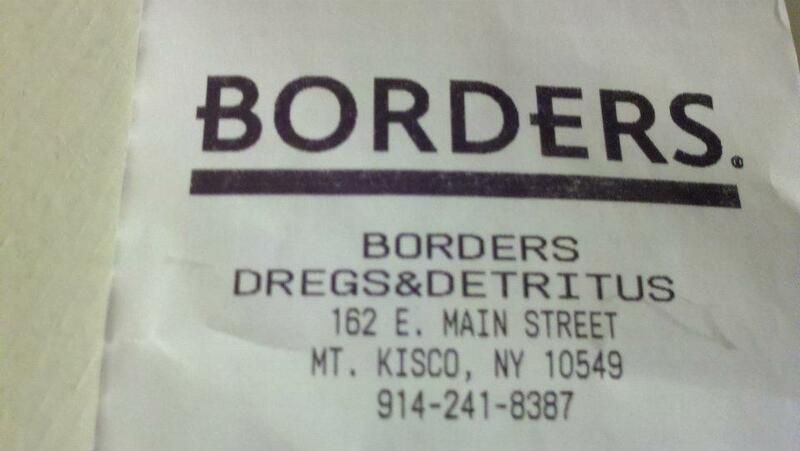 What sort of dregs and detritus could possibly be in them? Why are they being delivered to an image printing/blueprinting store? I swear there's a mystery novel waiting to be written from this photo, were someone so inclined. Also in this photo: my thumb, in the upper-left corner. I will find a way to blame that on my mentally deficient phone, and edit this post accordingly. Maybe after dinner. ,,,although, admittedly, I'd be emailing myself. Yeah, folks, sorry 'bout that: this post is nothing but a shameless plug for the home proofreading business I'm trying to get off the ground. I wasn't kidding about being sick of all these go-nowhere job applications, and I've been threatening to get something like this going for some time now. I wish I could offer Turned on Its Ear readers some sort of discount, but honestly I'm already doing this as cheap as possible just to get things rolling. Mention this blog and you'll get pushed to the top of the pile, though: that I can offer/promise you. Anyway, tell your friends, tell your enemies, tell your dumb boss by way of passively insulting him or her. Oh, and if you wanted to flag it for "best-of Craigslist" and get it seen by discerning stoners everywhere, that'd be heartily appreciated. Because, hey: nothing says CHEER like a good "Cemetary" Piece! 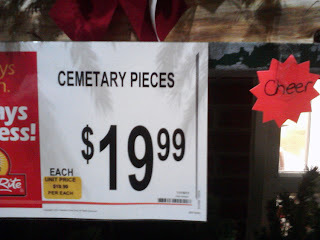 (Or, for that matter, maybe even a Cemetery Piece. 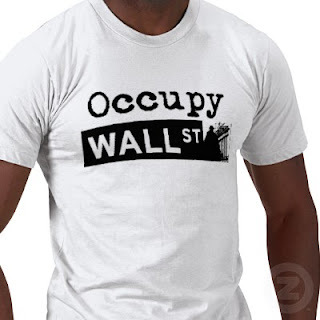 Seriously, folks: hire a proofreader. Preferably me.) It's the perfect thing for when a re-gifted fruitcake isn't quite middle-finger enough. Speaking of Christmas miracles, could it be that my not-so-smart phone actually managed to take a decent, in-focus, text-legible photo? Hallelujah! It's not enough to get me to renege on my stated intention to become a big old hypocrite and get an iPhone once this job stuff is settled, but still: credit where due. I can't stop watching this. It's absolutely mesmerizing. I'm old enough to know better. I don't care. EDIT: Embedded video changed to crappy camcorder job after the good quality one was Viacom'ed off of YouTube. Bastards. "So who in the hell is Kim Kardashian?" - My father, this morning. Honestly, I didn't have a good answer for him: "this annoying chick who I've gotta tune out for a couple of minutes before The Soup comes on E!" didn't really help him so much. Really, though, that's about all I've got. Years ago, before Moonstruck established her as an actress to be taken seriously, music critic Dave Marsh described Cher as being famous for being, rather than doing. It's a concept that applies nicely here. Alright, I'll fess up. I do know a bit more than that. She's an annoying chick who got married ten weeks ago, and sensationally filed for divorce on Halloween. I'm aware of that because the stupid hours-long special derived from the ill-fated wedding takes up nearly all of the time on E! not already allocated to either The Soup, or Chelsea Handler and Joan Rivers appearing on different shows as a sort of sunrise, sunset version of the same mouthy, occasionally amusing-in-spite-of-herself harpy. Quality programming over there - although, seeing as they've now got some time to fill where that wedding special used to live in their schedule, I'm no less talented than anyone I've already mentioned in this piece save for Joel McHale, and I do need a job. Just sayin'. Back to my point, if I indeed had one. Oh yeah: Kim Kardashian marries, divorces ten weeks later, gossip and exaggerated moral panic ensue. I don't truly understand why people give a damn in the first place about the personal lives of celebrities, even ones who have careers that have actually amounted to something more than being. Jennifer Aniston, Brad Pitt, the Royal Family? Yeah, don't care, unless they're all so crazy in love that they want to share it with the world and thusly agree to bankroll my wedding. In that unlikely scenario, sure, I'll at least send a thank-you card. Otherwise, who can really be bothered with any of it? Gossip-hounds, that's who, and maybe just normal, smart folks who need a diversion as well. As I type these words, my fiancée's People subscription is calling me a curmudgeon. So be it. The other half of this equation is the one that interests me a bit more: the exaggerated moral panic. It's demeaning to the concept of marriage! No, no it's not. It's a drunken mistake at best, a calculated, cynical publicity stunt at worst and likeliest. It would be demeaning to the concept of marriage if you, o moral crusader, as someone who firmly believes in its sanctity, married some bozo on TV and then dumped the creep before the holidays. It would also be demeaning to the concept of marriage if I, who am no moral crusader nor fan of religion but rather just a guy who believes heartily in saying and doing what I mean in my heart, did the same. These, however, are just dumb people on television, no more real than Eric Cartman or Stewie Griffin no matter how much the continuance of their "reality" shows depends on them desperately attempting to convince you otherwise. If you dig the plot of what they're selling, that's fine: a bit of mindless entertainment never hurt anyone, says the guy with Bait Car playing on mute behind him as he types this. Just remember that the fantasy/reality line is your friend, and be grateful for those among your family and friends who aren't mindless idiots, televised or otherwise. So, Dad, I guess I can answer your question now: Kim Kardashian is a bad actress. And, speaking of calculated, cynical publicity stunts, she is now also a way for me to get a bit of that Google random-hit love at a time when I'm looking to transition my blog back to the 50/50 music/non-music ratio that I inadvertently got away from somewhere around the time Charlie Sheen stopped self-destructing so publicly. Thanks, Kim, you're a doll.